How good is it to dream someone to make a wonderful breakfast and hot cup of coffee when you wake up in the morning,Well my dream came true and it was more than wonderful. 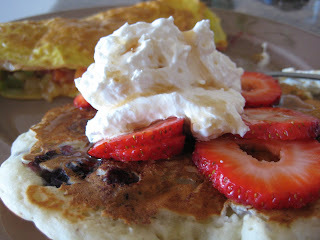 My Husband made one of the best omlette's that I had ever tasted and most heavenly pancakes! They were just delicious. I wanted this to go as a post, a gesture of gratitude for him. It was indeed pleasant and wonderful. The recipe for Omlette is from him for two people. In a grilling pan heat the oil and grill the vegetables till they are lightly cooked.Sprinkle salt on the vegetables and keep it closed. In a flat frying pan, heat oil and pour the beaten eggs to spread. let it cook for about 5 mins. Take couple of spoonful of vegetables and place it in the middle of the omllette and fold it in half and plate it as you like with toast or pancake. In a mixing bowl mix pancake flour and mashed banana and blueberry with water.Mix it to a pouring consistency( a lil thick). Heat the flat pan and butter it. Pour the pancake mixture and cook for about 1 min and flip to cook for another minute or so. Plate it and top it with freshly sliced strawberry and fresh whipped cream. Experience Heaven !!!! !